Welcome back everyone, this week we’ll focus on OA that can be purchased for $250 or less! I realize that many of the pieces discussed so far have 4 to 5-figure price tags, and want to emphasize that most OA is far cheaper, much of it in the low-hundreds range. Off the top of my head, here are a few acclaimed artists on high profile runs that won’t break your wallet! 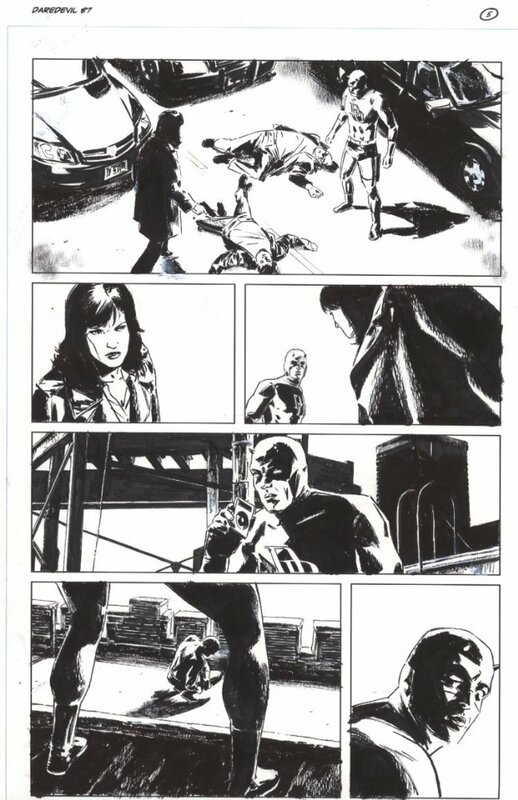 I was turned on to Lark’s art during his exceptional Daredevil run, and one of the main reasons I follow Lazarus is for his realistic, atmospheric artwork. 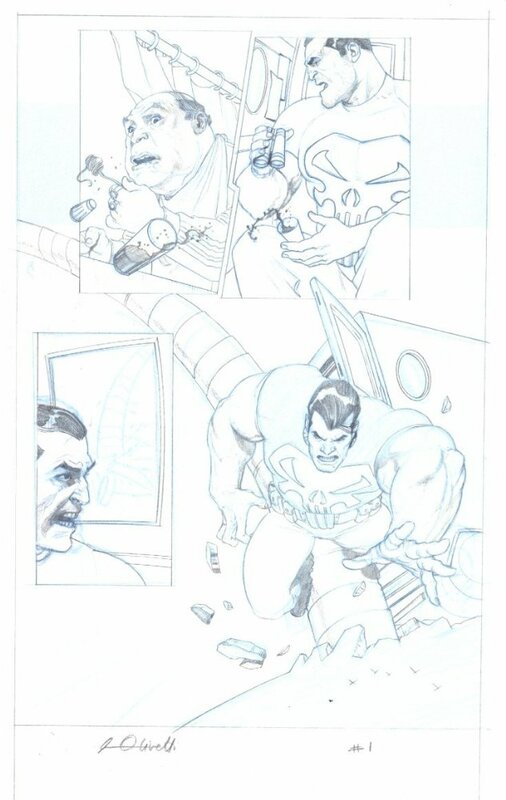 As excerpted from Splash Page Comic Art, Lark has illustrated Terminal City: Aerial Graffiti, Scene of the Crime, and worked on a number of other titles for DC/Vertigo, including All-Star Comics, Superman: War of the Worlds, Sandman Mystery Theatre, The Invisibles, and Legends of the Hawkman. 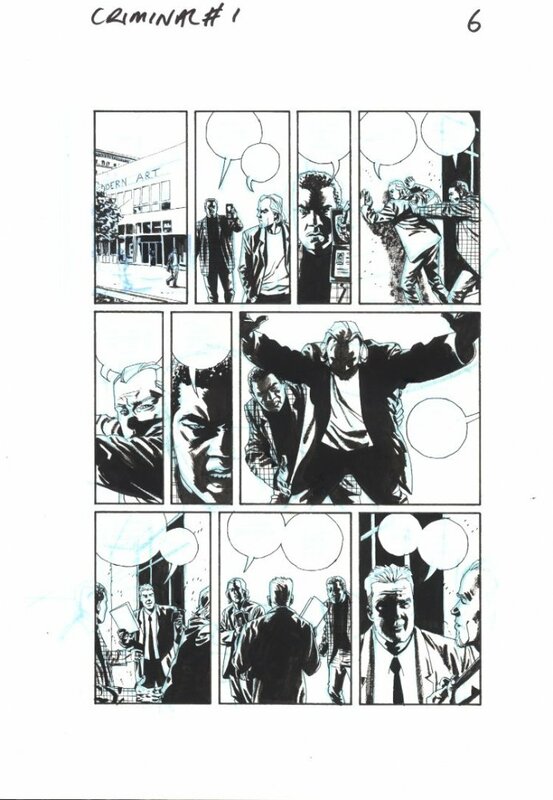 Michael illustrated an Eisner nominated run on Daredevil with Ed Brubaker. He also drew the Stephen King Dark Tower mini series The Battle of Tull. He is currently penciling a creator owned project with Greg Rucka titled Lazarus. Larroca is a stalwart of the comic book industry, having produced over two decades of work, almost exclusively for Marvel Comics. During that time, he’s drawn many of Marvel’s flagship characters such as the Fantastic Four, X-Men, Iron Man, Avengers, and recently, Darth Vader. Larroca’s style has continually evolved – from manga-influenced, to clean and technical, to a grittier look. Chances are, somewhere out there exists a piece of Larroca art with a character or style that you like! 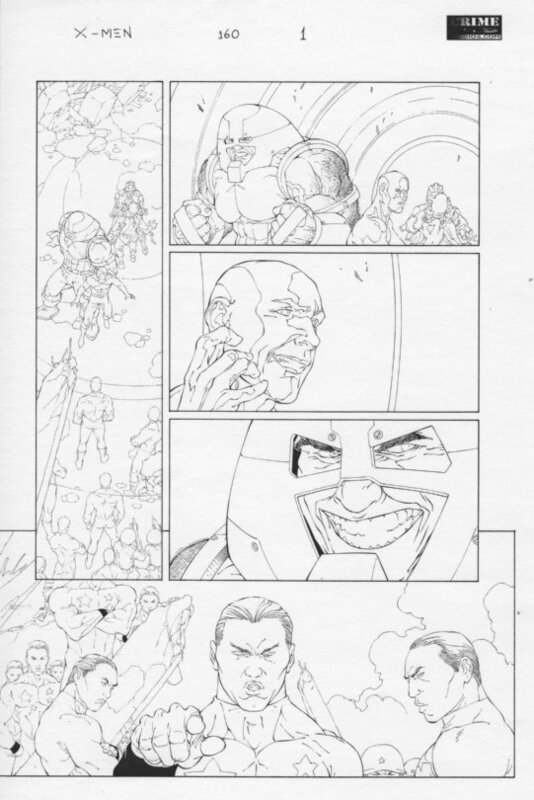 I’m a fan of his X-Men and Iron Man work, which were produced in a clean, tightly rendered style. I feel that at current prices Larroca’s OA is good value indeed, especially his runs on major titles such as Uncanny X-Men, X-Men and Invincible Iron Man, which feature a plethora of popular characters. McGuinness is another veteran of the industry, making a name for himself on Deadpool, Superman and Superman/Batman. He has a large body of Marvel work, drawing many popular characters such as Hulk, Avengers, X-Men, Deadpool and Spidey. McGuinness’ Art Adams-inspired, exaggerated yet fluid cartoony-style, has won him a large following. I personally think he’s at his best when portraying large, musclebound characters knocking the tar out of each other! Similar to Larroca, given McGuinness’ popularity and his large body of work on major characters, I feel that prices for his OA are rather reasonable. 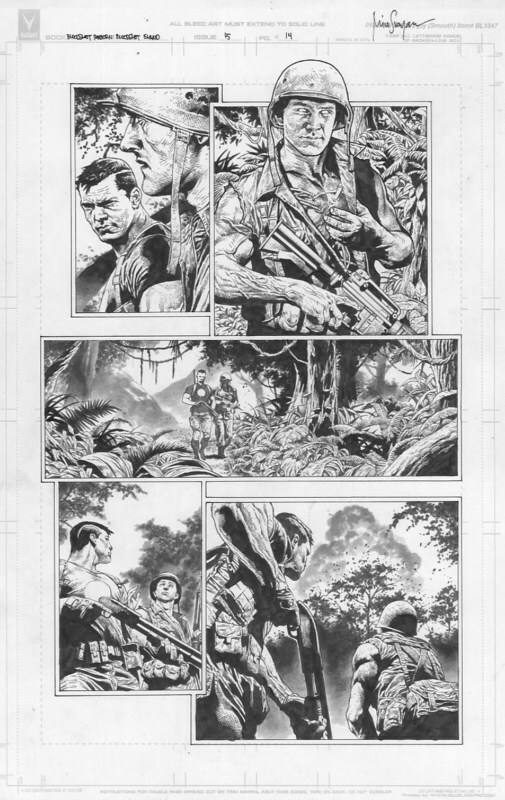 Olivetti is a master of many mediums, several of which he showcased in my favourite runs of Punisher War Journal, Cable and Incredible Hulk. I feel Olivetti is an extremely underappreciated artist, whose art deserves significantly more accolades than it currently receives. This does mean that Olivetti OA is affordable though! As excerpted from Splash Page Comic Art, Olivetti has worked in a variety of different techniques, including pencil & ink, digital coloring, acrylics and [oils]. From his first work at Marvel, Olivetti has drawn such titles as X-Man, Daredevil, Avengers, and at DC comics: Batman, Superman, JLA, and Space Ghost. Phillips is yet another comic book warrior, gaining prominence for his work on 2000AD, Hellblazer, Kid Eternity and Invisibles. As a lifelong zombie fan, I was first exposed to Phillips’ shadowy, macabre style during his delightful Marvel Zombies run. I’ve since become an admirer of Phillips’ work, following him across genres to Sleeper, Criminal and Fatale. Phillips won the 2007 Eisner Award for Best New Series for Criminal, and is also a multi-time nominee. Given his sterling artistic pedigree and body of work, Phillips’ OA could be considered “criminally” undervalued. I became a Suayan fan after meeting him at my first comic con, where he drew an absolutely jaw-dropping Juggernaut commission for me. I’d never seen pencil rendering as detailed as his before (or maybe even since), and made it a point to follow every title that he worked on! As excerpted from ComiConArt, [a]fter taking the comics industry by storm with his work on Moon Knight and Thor, Mico has spent the last several years lending his breathtakingly detailed covers to numerous titles across the DC, Marvel, and Valiant universes. 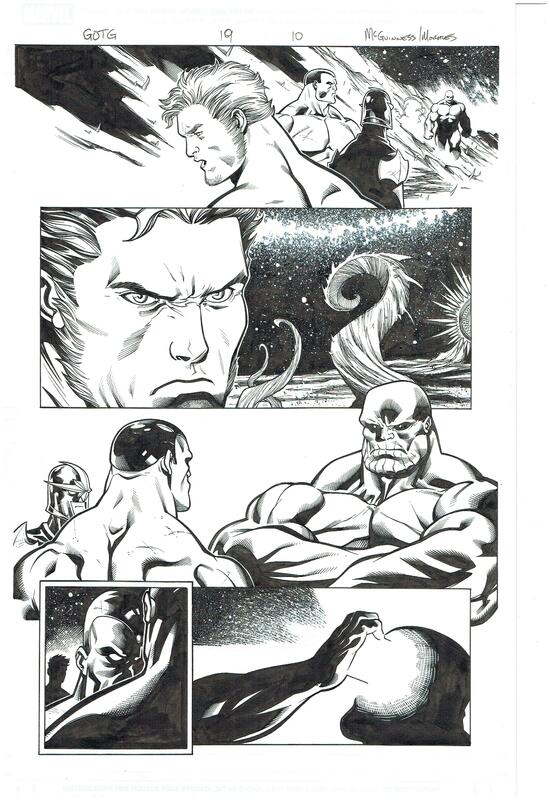 Mico is currently signed to an exclusive contract with Valiant, and his most recent work includes Bloodshot: Reborn. CLink’s Focused Auctions generally contain lower value OA than those in Featured Auctions, so pieces tend to sell for hundreds, not thousands of dollars. This particular Focused Auction ends on 6 February 2017, so there’s still time to pick up some art! HA runs weekly Sunday Auctions which increasingly consist of strips and non-superhero art, with a smattering of mainstream superhero OA. This is a good place to shop for art that’s slightly off the beaten path. Here’s something that’s been bugging me from the day I started collecting OA. When referring to a particular OA page, the page number referenced should be its story page number, not its line-up page number! What do I mean? Kindly refer to the sample OA page below. See that big red “14” in the top right corner “Line-Up Page” box? That’s not the correct page number to reference! Instead, look to its left at that “10” in the “Story Page” line. 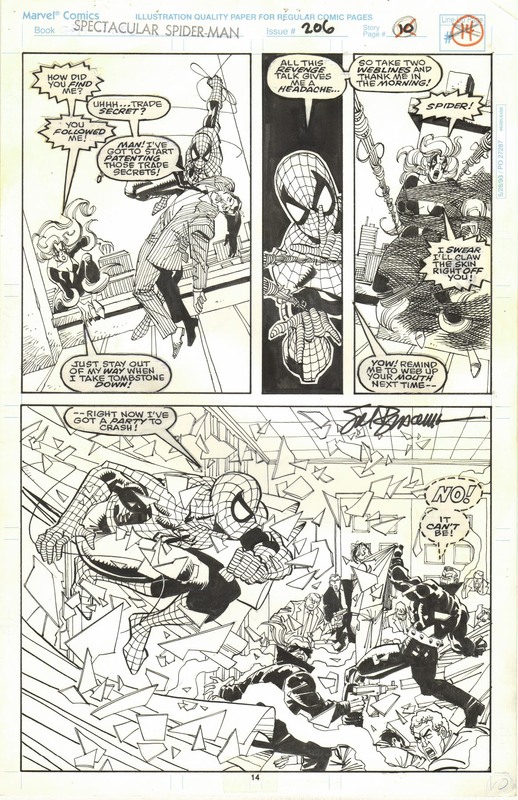 “10” is the page’s actual sequential position, according to the story’s progression. “14” is the published page number, with advertisements mixed in. When the story is read in a collected or online format, that “14” line-up page number is no longer accurate. So going forward, please reference an OA page’s story page number! Ok thanks for indulging my nitpicking. Thank you. Quickly becoming one of my favorite reads of the week. Not familiar with Mico Suayan, but love that example page! Thanks all, for your support!